Mercedes’ Lewis Hamilton again set the pace in Friday’s second practice in Hungary, but this time the Red Bulls of Daniil Kvyat and Daniel Ricciardo were his closest challengers – despite the latter’s car coming to a smoky halt late in the session. Kvyat’s best lap was three-tenths down on Hamilton’s, with Ricciardo a further two-tenths adrift. Nico Rosberg, fourth fastest in the second Mercedes and seven-tenths off his team mate, was the only other man to get within a second of the world champion’s leading time. Kimi Raikkonen was the front-running Ferrari in fifth, separated from team mate Sebastian Vettel by the Toro Rosso of Carlos Sainz. Fernando Alonso was an encouraging eighth for McLaren, with the Williams of Valtteri Bottas and Felipe Massa completing the top ten. 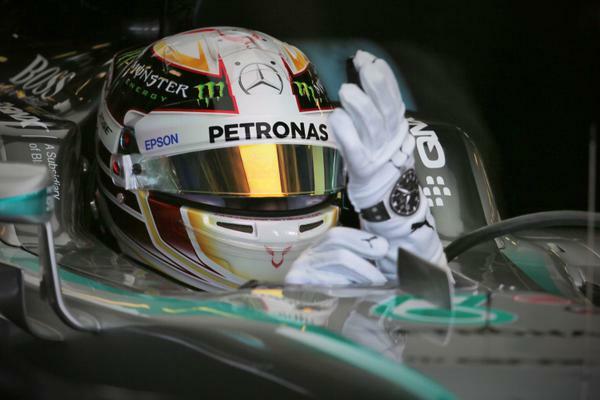 It was Hamilton who looked the most hooked up however, as the Briton – a four-time winner in Hungary – set the fastest time of 1m 26.132s on the medium tyres and then did likewise on the softs with 1m 23.949s. Kvyat and Ricciardo sprang surprises with 1m 24.300s and 1m 24.451s respectively, although it remains to be seen what fuel loads the top teams were running. The day also ended on a slightly downbeat note when Ricciardo ground to a halt, smoke spewing from his Renault engine, at the end of the session – although it was not his race engine, meaning the rest of his weekend will not be affected. Rosberg had to be content with fourth on 1m 24.668s after never really getting going on the softs, and then there was another gap to Raikkonen who continued to spearhead the Ferrari challenge. The Finn managed 1m 25.134s – which was momentarily the fastest time as he was the first to set time on the soft rubber. Vettel meanwhile had another lacklustre session and was only seventh, behind Sainz’s Toro Rosso, after also spinning in Turns 12 and Turn 1. 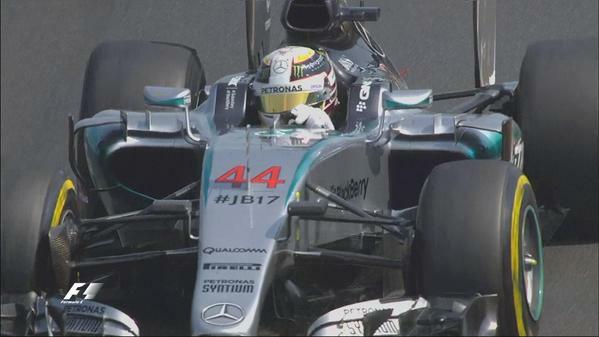 The German lapped in 1m 25.660s to the Spaniard’s 1m 25.599s. Alonso was next up, as he brought smiles to McLaren faces with the eighth fastest time of 1m 25.752s. That was fractionally quicker than Bottas’s best of 1m 25.881s, while Massa was similarly close, registering 1m 25.920s to book the final spot in the top 10. Max Verstappen, who continued to struggle with his Toro Rosso and complained of a funny-sounding engine, claimed 11th with 1m 25.935s, which was less than one tenth of a second faster than Jenson Button, who managed 1m 25.994s in the second McLaren. Lotus got going properly this time after their tyre problems were resolved, but time lost this morning held Pastor Maldonado back to 1m 26.090s and 13th place, while Romain Grosjean spun in Turn 13, went off in Turn 4, and ended up 15th on 1m 26.442s. Felipe Nasr put his Sauber between them on 1m 26.379s, but team mate Marcus Ericsson suffered brake-by-wire issues and was only 16th on 1m 26.831s. That left the Marussias in 17th and 18th as Roberto Merhi beat Will Stevens by two thousandths of a second, 1m 29.113s to 1m 29.115s. The Force Indias didn’t run as the team continued to investigate the causes of Perez’s morning accident. Besides those mentioned above, the afternoon’s miscreants included Kvyat, who spun in Turn 4, and Hamilton, Verstappen, Maldonado, Bottas, Ricciardo and Ericsson, who all briefly went off at the same corner. The Briton eventually posted a 1m 25.141s, which stood until the chequered flag despite Nico Rosberg’s best efforts – the German closed bit by bit on Hamilton’s benchmark, and eventually wound up just one tenth of a second down on 1m 25.250s. Those laps came after Perez had given everyone a scare by rolling his Force India. The Mexican ran extremely wide on to the rumble strips on the exit of Turn 11, appeared to suffer a failure of his right rear suspension, and was flicked sharp right across the track and into the barriers. That caused heavy damage, and appeared to also trigger his roll when the left front tyre – broken but still attached via the wheel tethers – dug in under the VJM08 and sent it into the air. Behind the Finn, Daniel Ricciardo narrowly headed Red Bull team mate Daniil Kvyat, with 1m 26.053s to 1m 26.070s. Ferrari’s Sebastian Vettel was next up, managing 1m 26.395s despite reporting power loss. Carlos Sainz was seventh for Toro Rosso on 1m 26.727s, with Perez’s 1m 26.776s retaining his eighth slot. Valtteri Bottas was ninth for Williams with 1m 26.825s as Max Verstappen completed the top 10 and the sub-1m 27s runners, with 1m 26.934s in the other Toro Rosso. There was a modicum of hope for McLaren with Fernando Alonso and Jenson Button 11th and 12th on 1m 27.272s and 1m 27.308s respectively, as Nico Hulkenberg took 13th for Force India on 1m 27.317s. Brazlian duo Felipe Massa and Felipe Nasr were next up – the Williams driver lapped in 1m 27.381s, the Sauber pilot in 1m 27.409s – while Nasr’s team mate Marcus Ericsson was 16th on 1m 27.732s. Q) I DON’T THINK I HAVE SEEN MORE HAPPY PEOPLE AFTER A CRASH, HOW ARE YOU? Q) WHAT WERE YOUR THOUGHTS AS YOU LOOKED OUT THE WINDOW AND SAW YOU WERE SURROUNDED BY CREW MEMBERS TRYING TO HELP? Q) THE CATCHFENCE. IT WILL BE A TOPIC OF CONVERSATION. IT KEPT YOU IN THE BALLPARK SO TO SPEAK, BUT DID IT DO ITS JOB? Q) JEFF GORDON SAID THIS STYLE OF RACING IS MORE LIKE A VIDEO GAME, BUT IN REAL LIFE. HOW WOULD YOU DESCRIBE WHAT YOU SAW THERE IN THE END? Dale Earnhardt Jr. endured a weekend of rain, a three-hour-plus pre-race delay, and nine caution flags to win the Coke-Zero 400 at Daytona International Speedway early Monday morning. 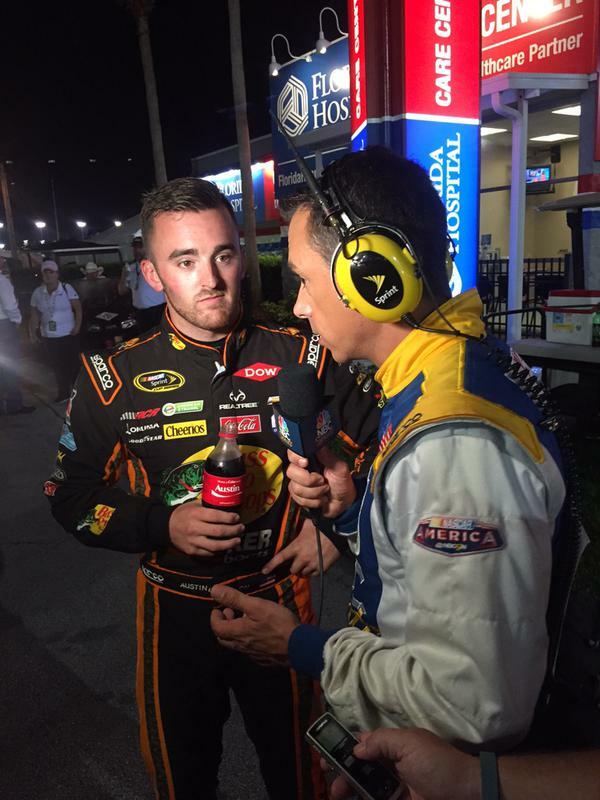 The race ended at 2:41 a.m. and concluded with a large crash featuring Austin Dillon’s No. 3 Chevrolet going airborne and smashing into the catch-fence near Turn 1 after he crossed the start-finish line. Dillon walked away from the wreck, the fourth major crash of the night. After being released from the infield care center, Dillon said he suffered a bruised tailbone and forearm. Pole-sitter Earnhardt dominated the night, leading 96 laps in his No. 88 Nationwide Stars and Stripes Chevrolet. He also had the convincing support of the fans remaining at the track following the 154-minute rain delay. The delay was a harbinger for the race itself, which included four multi-car crashes and those nine caution flags that covered 43 of the scheduled 160 laps before the green-white checkered finish. 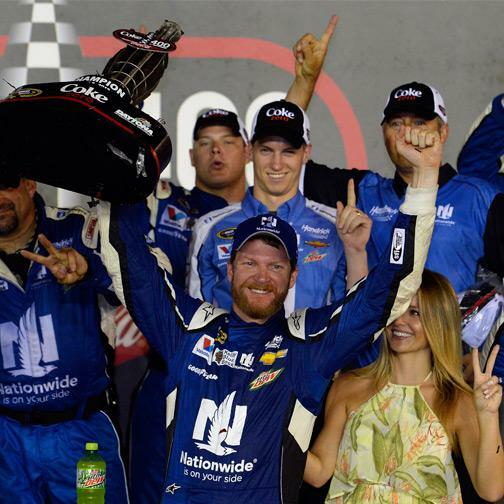 It was Earnhardt’s fourth NASCAR Sprint Cup career victory on the 2.5-mile Florida track. Driver Paul Menard could have been speaking for everyone at the speedway when he said on his radio during the race that Earnhardt’s No. 88 was “ridiculously” fast. Earnhardt consistently outran the competition on re-start after re-start. Earnhardt’s crew raced onto the track after the last-lap crash to check on Dillon’s condition. The catch fences at Daytona International Speedway were reinforced following an accident in 2013 during a NASCAR XFINITY Series race. 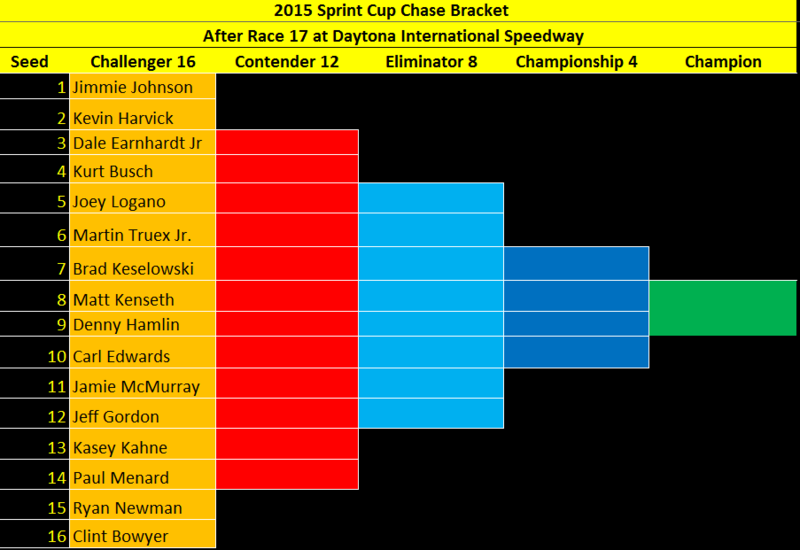 Denny Hamlin finished third, with Kevin Harvick and Kurt Busch rounding out the top five. Harvick leads the Sprint Cup points standings by 63 points over Earnhardt. Postrace tech is complete. No issues. Earnhardt Johnson KuBusch to R&D. Dillon car also will go to R&D for post-accident analysis. Time of Race: 02 Hrs, 58 Mins, 58 Secs. Margin of Victory: 0.122 Seconds. 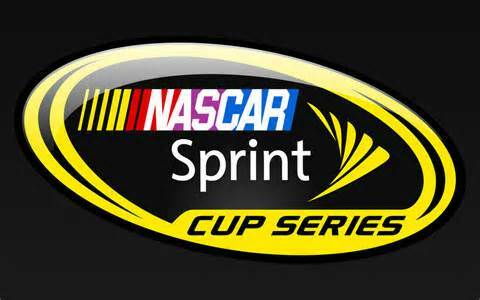 Next Up: The NASCAR Sprint Cup Series moves to Kentucky Speedway this week where it will debut its new aerodynamic package in the NSCS Quaker State 400 presented by Advance Auto Parts on Saturday 7:30 p.m. ET. 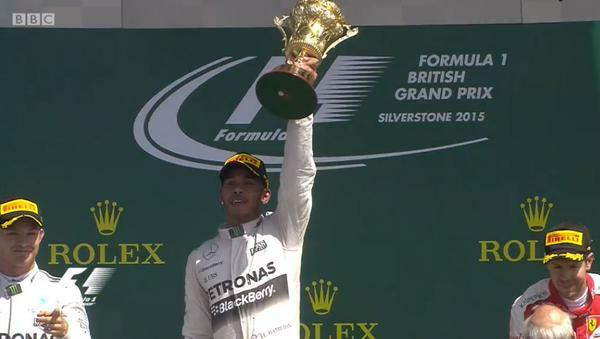 Lewis Hamilton won the 2015 Formula 1 British Grand Prix after an inspired drive in changeable conditions at Silverstone – his third triumph on home soil. The world champion saw off the threat of early leaders Williams, and then made an inspired pit call when rain hit late in the race to ensure victory over Mercedes team mate Nico Rosberg and the Ferrari of Sebastian Vettel. Excellent starts for Felipe Massa and Valtteri Bottas saw Williams in charge of the opening laps and it was only after the first round of stops that Hamilton took control. But when rain arrived around lap 35, Rosberg began to rapidly close on his team mate and it was Hamilton who blinked first, pitting for intermediate tyres on lap 43. It initially looked premature, but ultimately proved to be perfect timing, as the heavens opened over the circuit. The leading pack followed Hamilton’s example and after the stops panned out Williams were the losers, with Vettel jumping both their drivers, leaving Massa and Bottas a disappointed fourth and fifth at the flag. Nico Hulkenberg was seventh in the revised Force India, separated from ninth-placed team mate Sergio Perez by the Ferrari of Kimi Raikkonen. And there was finally reason to smile at McLaren, as Fernando Alonso scored his first point of the year in tenth. Drama at the rear of the field on the opening lap had accounted for the Lotuses of Romain Grosjean and Pastor Maldonado, and McLaren’s Jenson Button, as a domino-effect collision at Turn 1 also left Alonso pitting for a new nose. Sauber’s Felipe Nasr failed to even take the start thanks to gearbox issues on the formation lap, while Max Verstappen put his Toro Rosso into the gravel at Farm on lap 4. Next to retire was Red Bull’s Daniel Ricciardo – with electrical problems – on lap 23, while Toro Rosso stablemate Carlos Sainz succumbed to technical woes on lap 34. 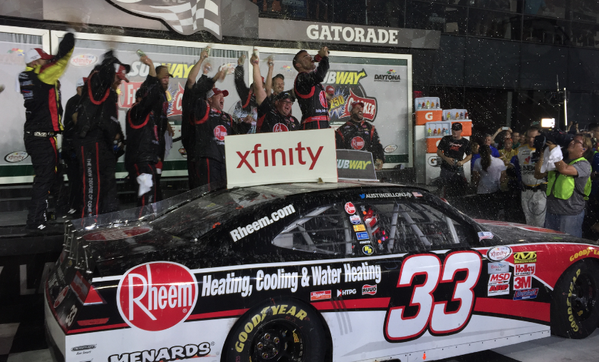 After a rain delay before the start, and then two red flags within 10-laps to go in Saturday night’s NASCAR XFINITY Series (NXS) Subway Firecracker 250, it was Austin Dillon taking the checkered flag ahead of Elliott Sadler to win at Daytona International Speedway. This was Dillon’s third series victory and 10th top-10 finish of the 2015 season, his fifth series career victory in 90 races, and his first series victory at Daytona International Speedway. Following Dillon and Sadler was the reigning series champion Chase Elliott finishing third, Kasey Kahne fourth and Benny Gordon finished fifth. Rounding out the top-10 finishing positions were Dakoda Armstrong taking sixth, David Ragan seventh, Erik Jones eighth, and series Rookie of the Year (ROTY) candidates, Harrison Rhodes and Ross Chastain bringing home ninth and 10th respectively. The current series points leader, Chris Buescher, finished in 12th and leaves Daytona with a 34-point lead over Chase Elliott. Time of Race: 01 Hrs, 57 Mins, 28 Secs. Next Up: The series heads to Kentucky Speedway on Friday, July 1oth, for the Kentucky 300, with an approximate starting time at 7:50 p.m. (ET) and television coverage provided by NBCSN.